It still holds true: everybody wants somebody’s love. Everybody needs somebody’s love. Angel Heart would be good if I could understand Japanese at a higher level, because then I’d be almost 32 episodes further along. The true combat waitress comes to the fore! 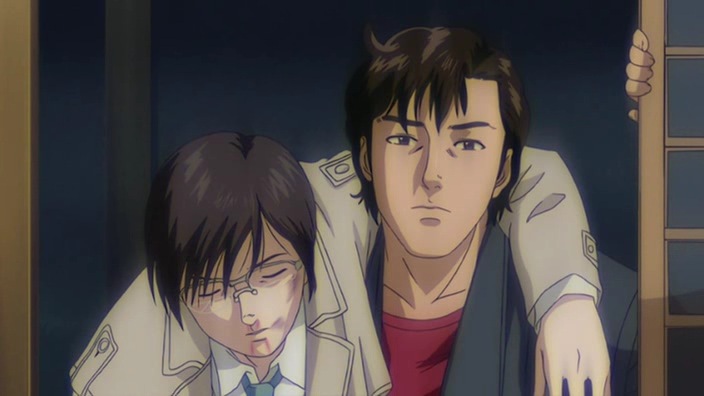 Xiang Ying’s dream memory takes her further into the origins of Kaori and Ryo’s relationship, thus destroying many senses of continuity with City Hunter. It’s enough to make my brain overheat and almost (but not really) envy those in the Angel Heart audience who have never seen its progenitor. I’m forced to view these characters by comparison with what I thought I knew because they do share fundaments. The new revelations about the identity of Ryo, however, are quite a shake. What could this be? An episode set in a dream that reveals long illusive details of the relationship between Kaori and … Makimura? I’m there! I just wish they had allocated more of the budget to this episode, which deals quite explicitly with these characters. I finally get Ikura Kazue with a major speaking role and, her updated character design aside, she doesn’t look like Kaori. On top of that we get several things that don’t gel with City Hunter continuity, but that’s par for the course at this point. I find that when I immerse myself in the world of Saeba Ryo, I’m on a different level of happiness. The first part of this episode was the standard solution to the problem raised in the previous episode, but after that I actually received a shock and was moved. This is like an actual City Hunter job. One might be turned off by the fact that the client is a child (anyone remember the “esper shoujo” story of City Hunter? ), but, in proper Saeba Ryo style, a real story emerges from it. Hell, I even laughed in this episode. It’s just that good. How is Ryo outsourcing his work to Xiang Ying anything like “the return of City Hunter”? I thought that the premise of this episode was flawed, which was helped in no way by the fact that the animators forgot how to draw. Aesthetically, this was painful to watch. Painful. The old dock sounds return and, as usual, every crime lord has their own tanker. Despite its wildly off model animation, this episode of Angel Heart does a good job of healing some relationships. It bows to several instances of bizarre comedy, and there are some hurdles I can’t quite overcome, but I would place this episode on the side of good.